The LEAP Program offers a Bachelor of Arts in Performing Arts from Saint Mary’s College. An individualized course of study is created so each student's personal academic goals and new career objectives can be reached. Students work with the LEAP Program Coordinator in their city to track their progress throughout their time in the program. All LEAP students are required to take ten liberal arts courses from Saint Mary's (see Core Curriculum). Designed and selected with the dancer's academic needs and interests in mind, these courses challenge, inspire, and equip professional dancers for lifelong learning and success. Students entering the LEAP program are qualified to challenge by examination (or "test out of") several of the required performing arts courses for the Dance Major offered at Saint Mary's. This significantly reduces the amount of time and money needed to earn the Bachelor's Degree and frees students to pursue their individualized courses of study. To further acknowledge the experience and expertise of the LEAP adult learner, through the Personal and Professional Assessment core curriculum course, each student will have the opportunity to write Experiential Learning Papers that may be further evaluated for tuition-free academic credit toward their degree. Transfer in credit from previous college course work. Test out of certain courses through the College Level Examination Program (CLEP). Take lower/upper division courses at an accredited community or state college. Earn course credit through experiential learning (see Prior Learning Assessment above). Earn credit from certificated coursework (including previously earned certifications such as Yoga or Massage Therapy). Take LEAP electives, on-line courses, or additional on-campus coursework at Saint Mary's College. Complete the 10-course LEAP Core Curriculum. Complete course requirements for the major. Attain a cumulative grade point average of at least 2.0. Complete 126 semester units of credit, 56 of which must be Upper Division. LEAP course work is completed in three or four years. There are three terms: Fall, Spring, and Summer. LEAP courses are offered in a hybrid format, blending participation in the classroom with online learning. 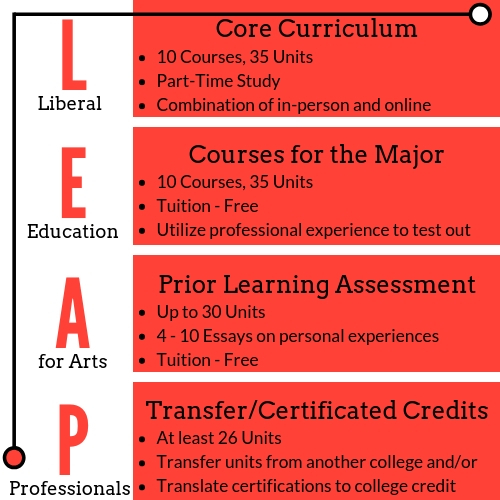 The program is designed to be completed within 3-4 years of part-time study, however since LEAP is an individualized program, the time it takes each student to earn the degree will vary.